Anne Kursinski uses three simple techniques to help riders improve their jumping and equitation. You may be surprised that two-time Olympic silver medalist Anne Kursinski asks riders to knot their reins, use a driving rein, and develop a "deep seat" to improve their jumping. Why in the world would these things work? ​Notice how the rider in the video keeps her elbows near her ribs, bends her wrists under, and braces her upper body heavily on her horse's mouth in an effort to control his speed and maintain her balance. Her center of balance is in her chest rather than in her lower body. This, in a word, is a disaster. It is cruelly uncomfortable for the horse and remarkable unstable for the rider. When a horse refuses or runs out of a jump, nine times out of ten, it is because the rider is riding this way. 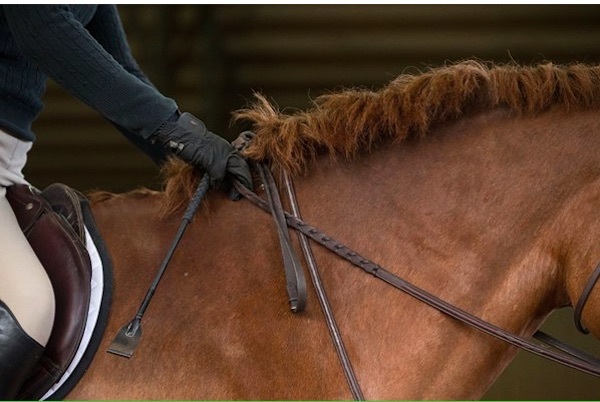 Kursinski asks riders to knot their reins several inches from the buckle and hold the reins in front of that knot. Now you would think that this shorter rein would create a death grip, but it doesn't. Instead, it forces the rider to stretch her arms forward, making her shoulders and elbows softer and more responsive to the horse's movement. It also typically softens the rider's hands so that they can develop a more elastic, feeling contact. This typically frees the horse to move with more fluidity and balance, greatly improving his way of going. 2. Use a driving rein to improve the automatic release. For quite some time now, the crest release has dominated jumping, particularly at the lower levels. But at the upper levels, most riders use an automatic release. Some believe that the automatic release should be taught right from the beginning. To see why, watch a little of this video. The opening photo shows a rider and mount in perfect balance over a jump, the rider using a perfect automatic release. The rest show how the crest release ruined jumping. If you're not convinced that the automatic release makes that big a difference, watch a little of this video. The opening photo shows a rider and mount in perfect balance over a jump, the rider using a perfect automatic release. The rest show how the crest release ruined jumping. Some riders will resist using these techniques because they depend heavily on their hands to balance themselves and to control their horse. As Kursinski points out, the ideal rider position is like a deeply rooted tree with a strong, solid base supporting free-flowing branches—your legs and seat being the trunk and upper body and arms and hands being the branches. To accomplish this, Kursinski asks riders to drop their stirrups, sink their heels down, and use their whole leg to feel how to “sit the saddle” and “melt into the horse’s back.” This is what trainers mean by a "deep seat"—both legs draped over and in contact with the horse's barrel, abdominal muscles slightly engaged, back flexible. You need to maintain this feel even when in two-point. As Kursinski points out, slowing or bringing horses to a halt is not about the hands. It is about engaging your core muscles. Without this, your horse will pull you forward into an ineffective position, or will run through your hands, becoming stronger and less controllable as you continue through a jump course. If you doubt that it is possible to do this when jumping (or even when in two-point), watch this video. It will change the way you think about jumping forever. Welcome to the best information about effective horse training and horse care! Whether your goal is improving your riding, caring for your horse, or starting your own horse business, you will find what you need here.